With the popularity of pickup trucks among consumers, it seemed only natural that NASCAR could successfully introduce a series for these vehicles. The concept of a championship using tube-frame trucks made its debut in 1995 with twenty events. Winning the first NASCAR SuperTruck title was Mike Skinner in a Chevrolet. 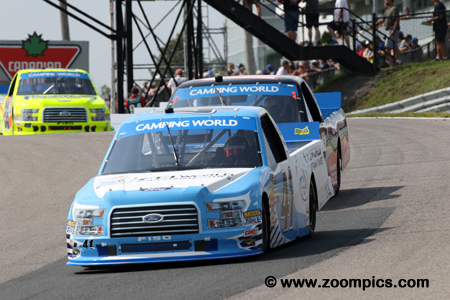 With sponsorship from Camping World, the current schedule is made up of twenty-three events with most races taking place on the traditional paved ovals – the two exceptions are the road course at Canadian Tire Motorsport Park and Eldora Speedway which is a dirt track. The trucks are constructed using a formula that is similar to the cars. Bodies are hung on a steel tube-frame chassis built to NASCAR specifications. The vehicles are powered by 6-liter (366-cu.in.) V8 engines which produce approximately 700-horsepower using the unrestricted regulations and about 450-horsepower in the restricted configuration. These naturally aspirated motors are fitted with a four-barrel carburetor and run on 98-octane E15 unleaded gasoline. The minimum weight for a truck without a driver is 3,400-pounds. Manufacturers participating in the series are Ford, General Motors and Toyota. 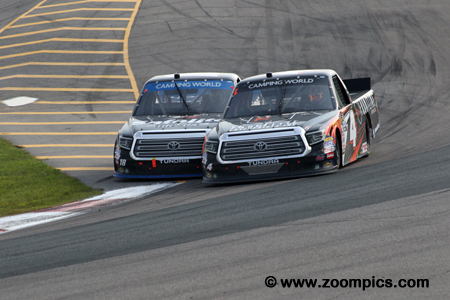 2018 was the NASCAR Camping World Truck Series sixth visit to Canadian Tire Motorsport Park. 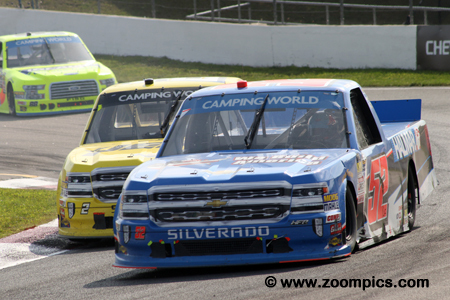 Canadian Tire Motorsport Park was not the first road course to host a NASCAR Truck race but is the only event of this type on the current schedule. Drivers would compete for sixty-four laps around the ten-turn 2.459-mile track. 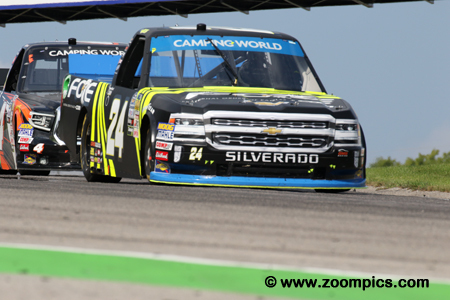 The exciting news for fans attending this event was that the Chevrolet Silverado 250 would be the opening round of the Camping World Truck Series’ playoffs. This would be the first of seven races to crown the 2018 champion. 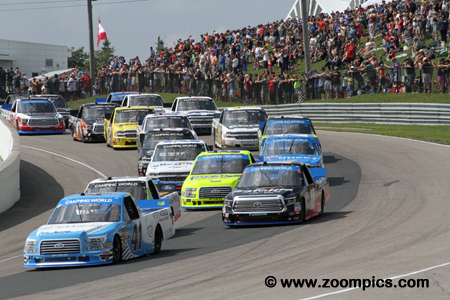 Thirty-two starters funnel into Canadian Tire Motorsport Park’s first corner for lap-one of the Chevrolet Silverado 250. Leading the field is the pole-sitter, Ben Rhodes in the FEI World Equestrian Games Ford F150. 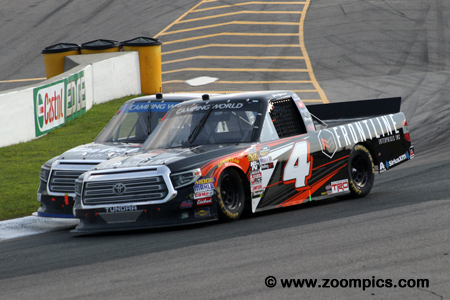 Tucking in behind Rhodes is the Toyota Tundra of the second fastest qualifier, Noah Gragson and Myatt Snider in the Carolina Nut Company Ford F150. Justin Haley was able to benefit from the last lap incident between Noah Gragson and race leader, Todd Gilliland to score his second victory of the season. Haley qualified eight in the Fraternal Order of Eagles sponsored Chevrolet Silverado. He finished third in segments one and two and was in the perfect position on the final lap. Haley passed Gilliland and Gragson for first place as they spun on the front straight. Ben Rhodes drove the No. 41 Ford F150 and was the quickest driver during the qualifying session. This was Rhodes’ third pole of the season – he was the fastest qualifier at Martinsville and on the dirt at Eldora. His season also included a victory at Kentucky Speedway. At the start, Rhodes led for the first six laps and finished second in stage one. Issues in stage two caused him to drop out of contention and finish fourteenth. Todd Gilliland qualified fifteenth in the No. 4 Toyota Tundra. The highlights of Gilliland’s season included a pole at Daytona in round one and a runner-up finish at Gateway. He wasn’t a factor in the first two segments at CTMP but adjustments during the last pit-stop allowed him to move into first place on lap-54 and lead the event until the final corner. The collision with Gragson resulted in an eleventh place finish. Aside from Justin Haley the next major beneficiary of the last lap incident between Todd Gilliland and Noah Gragson was 2016’s controversial winner, John Hunter Nemechek. 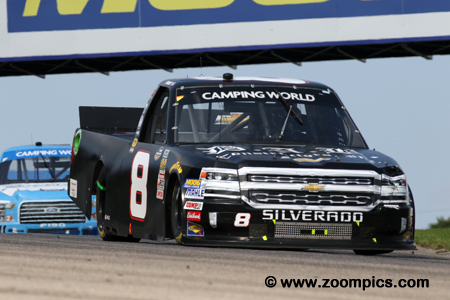 Nemechek qualified seventh in a Chevrolet Silverado owned by his father ‘Front Row Joe’. He finished fourth in segments one and two. It appeared that Nemechek would take home a fourth but the last lap contact promoted him to second. 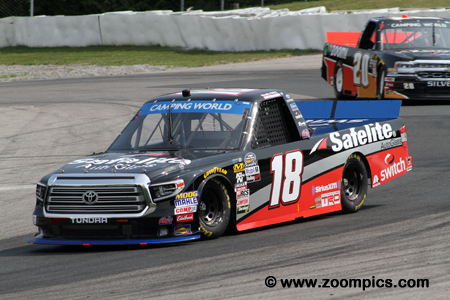 Last year Noah Gragson made his debut at Canadian Tire Motorsport Park and finished second. In May, Gragson used the NASCAR Pinty’s race to gain some valuable track time and finished third after starting thirteenth. At the NASCAR Camping World Truck race, he qualified on the outside of the front row, won both segments and led 35 of the 65-laps. Unfortunately, an aggressive move on Gilliland resulted in a ninth-place finish. Brett Moffit drove the No. 16 Toyota Tundra with backing from the local dealership, Don Valley North Toyota. 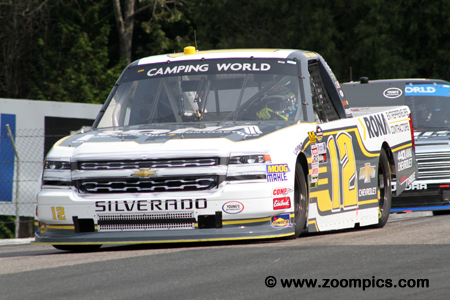 Moffit was gridded seventeenth for the start of the Chevrolet Silverado 250. He moved up the race order – finishing sixth in the first segment and second in segment two. On the last lap, he was able to weave through the Gilliland/Gragson incident and grab a third-place finish. Canadian, Steward Friesen is yet to win a NASCAR World Camping Truck race but this year he has had runner-up finishes at Bristol, Texas and Kentucky. Friesen began his racing career on the dirt ovals in southwestern Ontario and western New York. In 2016, he made his debut in the Truck series but 2018 is his first full season. The Niagara on the Lake native qualified sixteenth at Canadian Tire Motorsport Park and finished seventh. The next best result for a Canadian competitor was former Indy Car veteran, Alex Tagliani. 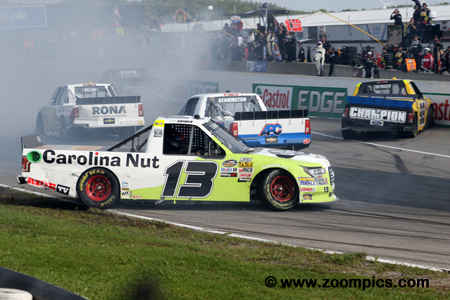 Earlier in the day, Tagliani won his second race of the NASCAR Pinty’s season and his first at Canadian Tire Motorsport Park (CTMP). 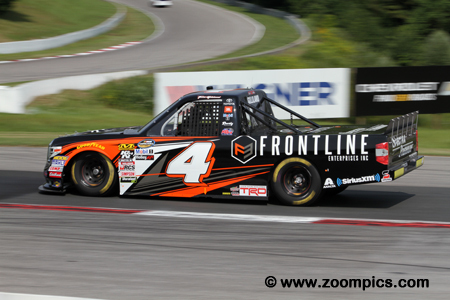 His best result to date in the NASCAR Camping World Truck series at CTMP is a fifth place. This year with backing from RONA, Tagliani started and finished tenth. 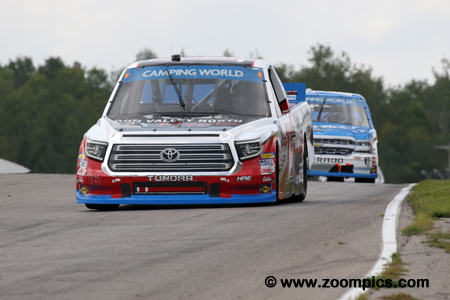 In four of the last five years that the NASCAR Camping World Truck series has visited Canadian Tire Motorsport Park the final lap of the event has ended in controversy – this year would be no exception. With three laps to go after the final caution the leader, Todd Gilliland and second place Noah Gragson pulled away from the field. 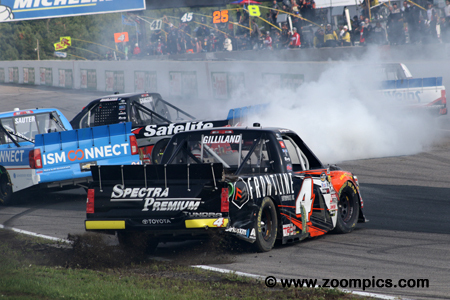 In an attempt to win the race, Gragson attempted to pass Gilliland in the final turn. It was inevitable that the two drivers would make contact and spin. Gilliland and Gragson slid off the racing line. Justin Haley who was in third place narrowly avoided making contact with Gragson and slipped by to take the lead and win. Gragson slid backwards and was perpendicular to the racing surface when the remainder of the field arrived. Drivers were forced to make a choice with some benefiting and others crashing. Those drivers successfully clearing the incident included John Hunter Nemechek, Brett Moffit, Timothy Peters, Matt Crafton, Johnny Sauter and Stewart Friesen. The competitors that weren’t as lucky were Grant Enfinger who dropped from eleventh to seventeenth and Myatt Snider who finished nineteenth after being in fifteenth place on the last lap. The other big losers included Austin Wayne Self and Bo LeMastus.